…Can I run a cable from my SWM 400 feet to my guest house? (The answer, by the way, is ‘no.”) Trying to get satellite service to multiple locations far away is pretty challenging with DIRECTV’s SWM technology. It was originally built to work in normal-sized homes and there are some issues scaling it to much larger homes. SWM is a two-way system and two-way amplifiers don’t work well with it. Bi-directional amplifiers tend to have issues running through splitters and the amount of amplification needed isn’t always the same. Each receiver sends information back to the multiswitch and making sure all those signals are properly balanced would require an expensive piece of equipment that doesn’t exist. In addition, SWM is designed to be a low-latency system and longer cable runs introduce latency. SWM frequencies lose about 7dB per 100 feet and the frequency window is small. Here’s a bit of math. SWM signals start out at about -26dBm. 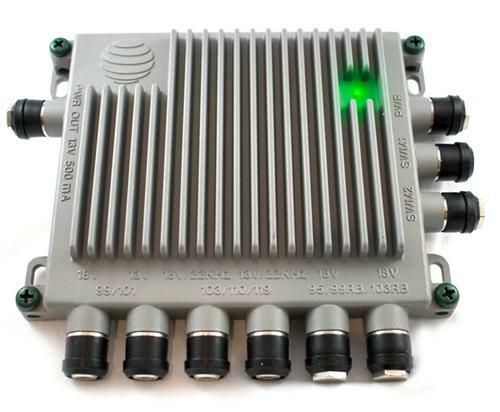 You’ll lose 14dB from an 8-way splitter, meaning the signal strength is at most -40dBm. The signal starts to break up if it gets below about -55dBm. That means you have about 15dB to lose over long cable runs, and that means a smidge over 200 feet is the longest possible run. What can you do if you need to run longer cables? If it’s just matter of “a little longer” you can use a Genie client at the end of a run with a Wireless Video Bridge. This will let you get about 50 more feet from the video bridge to a wireless Genie mini client. Another option is the use of RG11 cable. RG11 cable loses less over distance and you can get about 275′ from the splitter to the receiver or client. However, RG11 cable is more expensive and harder to work with. It should only be used for runs over 100 feet. If you need a much longer run, it’s advisable to either run cables straight from the dish (and use a second SWM) or use a second dish. If you choose a second SWM you’ll need 6 cables from the dish, and that does end up being a lot of copper. The downside to both these options is that you can’t share programs. You can’t have a Genie client on one SWM with the Genie on the other. You need to use traditional receivers on one of the runs and a Genie system on the other. There is a high-powered version of the traditional SWM that is designed to get a signal 300 feet or more. The output signal is about 100 times stronger than a normal SWM. We don’t sell it at SolidSignal.com because the potential for damaging your receivers is too great. However our phone sales reps can get it for you if you’re sure you can take the risk. well you know the rest of the quote. If you are planning on using a high-powered SWM you need to make sure the level at the receiver or client is always lower than -30dB. This may mean adding additional splitters or attenuators to drop the signal down if the receivers are close. Always use an AIM meter to make these measurements. You can get a much deeper dive into this issue by looking at our free downloadable white paper on the subject. While it was designed with the older-generation SWMs in mind, the numbers are exactly the same for the new SWM-30. The major difference is that neither the diplexer nor satellite meter mentioned in the white paper work with a SWM-30. How does your DVR really work?